1. Place a cup of cold water into a Pyrex measuring cup. 2. Remove candy from heat. 3. Spoon 1/2 teaspoon of syrup into the cold water. Use care as the syrup will be very hot and can cause severe burns. 4. Pick the candy up from the cold water and roll into a ball. Soft Ball - The candy will roll into a soft ball, and will quickly remove its shape when removed from the water. Firm Ball - The candy will roll into a firm but not hard ball. It will flatten out after being removed from the water. Hard Ball - The candy will roll into a hard ball which has lost most of its plasticity and will roll around on a plate after being removed from the water. Light Crack - The candy will form brittle threads in the water and will soften when removed from the water. Hard Crack - The candy will form brittle threads in the water and will remain brittle when removed from the water. Caramelized Sugar - The sugar melts and becomes golden brown. It will form a hard brittle ball in the cold water. It's much easier though to use a candy thermometer. Below is a picture of a glass candy thermometer, and below that a chart of candy making temperatures. Note our candy thermometer came with a plastic sleeve to protect it from breaking in the utensil drawer. 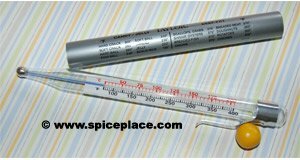 Below is a picture of another type of candy thermometer. This candy thermometer is made of metal and has a sliding arrow that allows you to point to the temperature your going to heat the candy to. 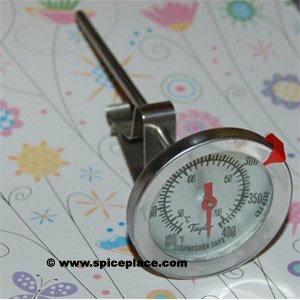 Note that both the glass and metal candy thermometers have clips to attach to the pan the candy is being heated in. This is a great resource. I love to make candy, but sugar is the devil to work with. If you don't get it exactly right, you have to start all over. I don't know how many batches of divinity I've ruined. I agree; candy is tough. The results are worth it if you get it right, but it's so tricky to work with and the temperatures are critical. I need to send these descriptions to my sister. She was trying to make candy for Christmas and had no idea how to water test. Honestly, I don't know how she grew up in the same house as I did and doesn't know this stuff! Thanks for the tips. I have often wanted to make candy but wasn't sure how to and what tempatures I should get it to. Hopefully with this tips I wont be throwing away alot of batches.